Blasting is the forcible application of an abrasive media to a surface by pneumatic pressure, hydraulic pressure, or centrifugal force. The stream of high-velocity sand-sized particles is used to clean metal objects or provide a texture to poured concrete. Respirable dust from the abrasive materials used poses a risk to the lungs. 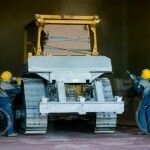 From blasting aluminum to blasting with silica sand, blasting applications and the equipment needed to contain airborne contaminants varies widely. Air Purification, Inc. can help you capture dust from all types of blasting, including sandblasting, abrasive blasting, media blasting and more. Air Purification Inc. will help you determine the best dust collector based on the given method of blasting: what type of material is being used, whether it is performed within an enclosure or not, what kind of special filters are required, etc. Dual booth modules can create an excellent blast booth to contain all harmful contaminants.